My name is Anh-Tuan Tran, I am a co-owner of a streetwear-based clothing line called FYSH Clothing Co. (www.fyshclothing.com). I just recently got hooked into the world of papercrafting after stumbling on Mr. Marshall Alexander's site from a gizmodo blog. For the past few weeks, I've been making papertoys for everyone I know and giving them as gifts, and people absolutely loves them. I've been an avid collector of vinyl toys (dunnies, munnies, kidrobot stuff), so papertoys was naturally very appealing to me. I save every cool pdf I stumble upon now, and I've already used up all the ink on my printer printing them. From this new found obsession, I started attempting to create my own papertoy based on the character that I created for my clothing line. Unfortunately, the curvature of the character has proved to be a problem and I have not been successful. I knew I needed some help so I emailed Mr. Marshall Alexander with a proposal and asked for his help/collaboration because I was a big fan of his work. 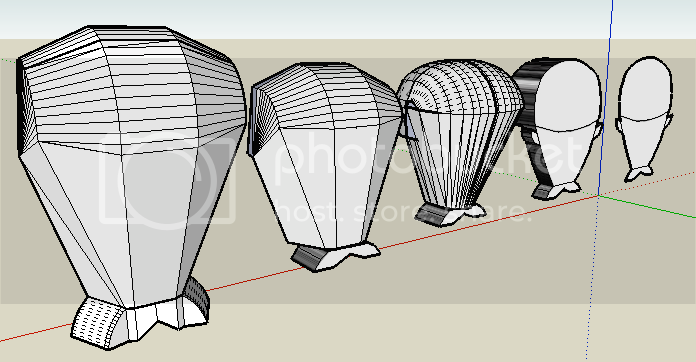 Sadly, Mr. Alexander did not deal with the curvy papertoy characters as well, and he referred me to this community and recommended that I look into the pepakura software and bring up my proposal to someone in this community. So basically, I have this character, he's a whale named Fysh. Fysh always looks confused because he doesn't know why his name is Fysh since he's a whale. FYSH is actually an acronym for Four Young Sneaker Heads. There's 4 of us that runs the company and we got started/brought together because we all collected sneakers (hence sneakerheads). The character is very simple, and he makes a great base character for people to customize. Attached are images of this character, as well as some past 3D solidworks rendering that someone made for me in college. Please let me know if anybody is interested in collaborating with me on this project, in return I can offer Fysh merchandise, promotional services, collaborative services, money, whatever you think is a reasonable barter for your help. I can assist in any artwork or coloring to help complete the final pdf for people to download. The papertoy will be free for people to download and customize and I will give credit to whoever helps me. An interesting project. I have been exploring paper toys for a couple of months, and I'd recommend not going for the full 'roundness' of character. It would be possible, but rounder shapes use more cuts/planes than block shapes and the result is not as clean and nice to construct as many of the best toys. Why don't you consider stylizing the character even futher? I think really simplified toys are in some ways more attractive than a many paged papercraft with many pages of pieces- It's great for something like the ultra realistic Hellboy gun, but maybe too much for a simple friendly character? Hey Mystery Action, I started drawing up my character with straighter lines and I am working on a 3D image of him with square shapes. The roundness is looking to be too hard to create, and I want to have a very simple and easy model that anybody can create. I will post pictures tonight. All I really want is to retain the likeness of the character, which is mainly the distinct eyes. But let me know if you're interested in working with me, that would be great! well... it's a nice looking character. The problem with the boxy design I have right now is that his "The Juggernaut"-like head appeal is gone. The whale's dome-like headshape is such a distinct part of the character, do you guys have any suggestion for creating a dome-like head? I am trying Anh, you have got me interested! one idea might be to thicken your 2-D design so the front and back are flat but step the head forward so it still overhangs the body. That way the sides would still be curved but the front and back would still be flat for simplicity and a sharp paint job ;) ...I'll try and show you what I mean. Another possibility might be to dome the head top and make the body a wedge shape. Rommy is an amazing model because it is such a pleasure to assemble (as well as processing industrial strength cuteness!) But notice that, like a lot of the toys on NPT, he is made of wedge shapes. he only has one subtle curve (on his face). It's my ambition to make a toy as well designed as that! and it got me thinking about creating the dome head separate from the body. I am was trying something like that, but it's just too complex. I want a simple model and I like your idea a lot. I drew what I think you're talking about. BTW, if you have old Rommy pdfs, could you hook me up? I only have the most recent ones. I want to make the rest. I'll try to find Hyper R and Flat Red for you as well if I stumble onto them. Anyways, attached is an image of what I am thinking you're talking about Mystery. I did it in paint cause that's all I have, I am at work. It's very bad, but you'll get the point. The dark shade shows depth. Sorry for the scrappy models! I think simple is best, say the second one from the left and the second one from the right. How about you? Careful to keep the character of the original. Sneakers? What flavour sneaks? Nike? Adidas? I mainly collect Nike SB dunks and Jordans, but I have a bunch of Adidas and Vans and skateshoes that I rock daily. Are you a collector as well? Oh NOOO, photobucket is blocked at my workplace =[ . I'll have to see it once I get home, blah! I can't wait to see your model. I need to take pictures of mine's. Oh man! That's freaking sweet! I have to say the simple ones you mentioned are the best looking ones. If we could make the head overhangs the body from the front and back, I think it would be perfect.